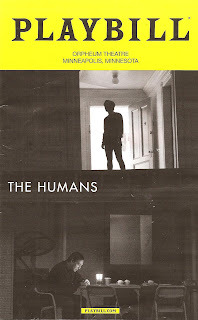 The Humans takes place at Thanksgiving dinner, with the Irish Catholic Blake family gathering at daughter Brigid and her boyfriend Rich's new place in Chinatown. Mom Deirdre and Dad Erik have driven in from Scranton in a snowstorm, with elderly grandma Momo, suffering from severe dementia, in tow. Other daughter Aimee, dealing with career, health, and relationship crises, rounds out this little family of six. The play is filled with the typical family jokes, reminiscing, and spilling of secrets. The big spill comes near the end of the play, when Erik finally tells his daughters the bad news that's been hinted at (which is bad, but not as bad as I feared). There's no resolution after that, the dinner ends, and everyone goes home. This is a slice of life in the long story of the Blake family, a life that has existed before and will continue to go on. But one gets the sense that this will be a Thanksgiving they'll never forget. This wonderful and familiar cast truly feels like a family. The family patriarch is played by Richard Thomas, accomplished stage actor who was a child actor on Broadway before his most well-known role as John-Boy on The Waltons. He's so wonderful as Erik, a typical supportive dad who sometimes drinks too much or says the wrong things, but you can feel the love he has for his family, despite the mistakes he makes. Another familiar face from TV, Pamela Reed, is equally good at mother Deirdre, who's maybe a little judgmental but it's just because she wants the best for her girls. Lauren Klein (reprising her role from the Broadway production) spends much of the show nodding off as Momo, but when she's awake, her portrayal of a woman lost in herself is heart-breaking. Daisy Egan (giving me some Elizabeth Moss vibes) and Therese Plaehn are both excellent as daughters Brigid and Aimee, and Luis Vega is charmingly awkward as the boyfriend trying to impress the family. 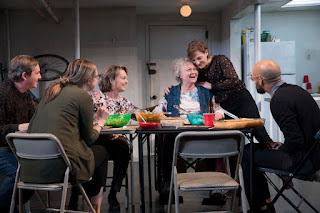 Under director Joe Mantello (who, I must note, was the original Louis in Angels in America, my current obsession since I'm seeing the new revival in NYC next month), the cast really gels and performs the intricately layered dialogue, emotions, and storylines of the play beautifully. connecting the two levels (see the cover of the playbill - the final scene). Since they've just moved in and their furniture has yet to arrive, the space is sparsely populated with folding chairs and a few pieces of hand-me-down furniture. 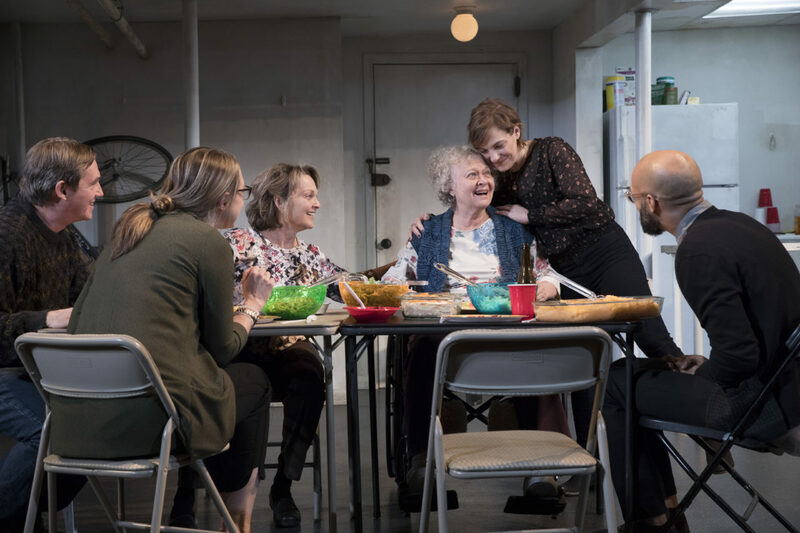 The multiple levels allows for multiple scenes happening at once, and since it's established that conversations can be heard, we get to watch characters react to what is happening on other parts of the stage (scenic design by David Zinn). The Humans can best be described as a family dramedy. But let's face it, every family is a dramedy, life is a dramedy. There's humor and laughter amidst disease, loss, and hardship. That's what makes us human. The Humans continues through this Sunday only, with student/educator rush tickets available (more info here).